· 3 Alloy poles up in minutes. · Tough marine woven, nylon lasts and lasts! · Over 9000 units sold worldwide! Suitable for saloons, hatches, estates and vans up to approx 1.5m(4'11)" high. 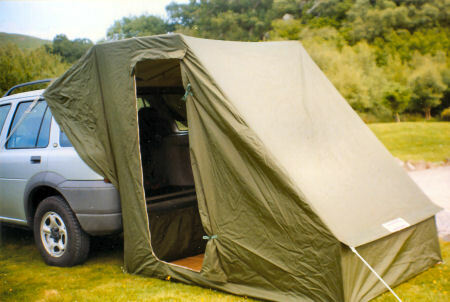 Tent+Free Standing Kit + Groundsheet also Now on Special Offer! Suitable for compact vans, MPVs and 4X4's up to approx. 1.7m (5'7") high. Freestanding pole set and security screen seal off the open end. A heavy duty groundsheet is useful under the tent floor on sharp stones or wet ground or to wrap a wet tent when travelling. Available to purchase with your order. Use under the sewn-in floor on sharp rocks, severe mud etc. Totally waterproof webbed material. Keeps your Caranex tent protected. POSTAGE COSTS ARE FOR UK MAINLAND ONLY. Elsewhere at extra cost- Please contact us for a quote.